Just when you thought you’d cracked camping in the great outdoors, along comes festival season. And, as you may know, festival camping is an entirely different ball game to setting up your tent in a lush meadow with only sheep for company. There's so much more to think about than just the size of your tent and whether it has decent waterproofing or blackout fabric to stop the sun from blinding you awake at 5am... When you're still hungover. Yes, from the stagnant whiff of chemical toilets to the mini lakes of ankle-deep mud separating you from the main stage, festival camping is a survival situation (albeit a fun one) in itself. Don't let that put you off, though. Festival camping is something everyone should experience at least once, and there are some simple tricks to help you have the best time, come home in one piece, and still have all of your belongings with you. Read on for 10 tips to ensure you're well kitted out, and prepared to not only survive but thrive among all the glitter-strewn madness. 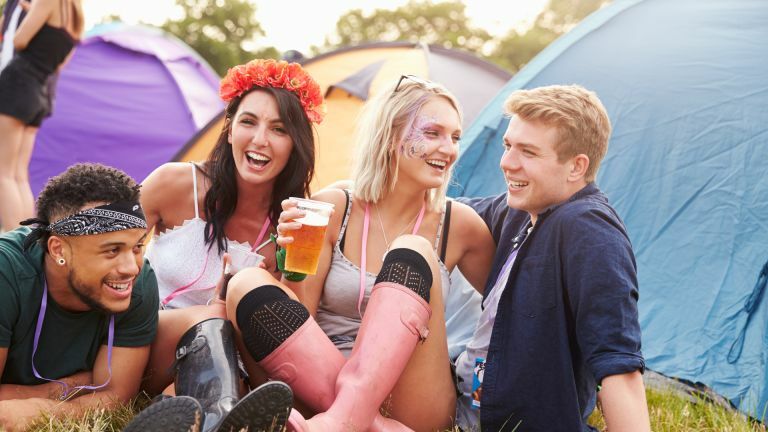 A rookie error many people make is splurging cash on fancy dress outfits and copious amount of booze, then buying a flimsy tent with their remaining budget. Hey, we love a good costume, and certainly appreciate a bottle of spiced rum, but neither will keep you dry and sheltered when the heavens open. Buy too small a tent and you'll feel cramped and claustrophobic, with zero room to dress let alone share that space with others. Get a tent that's too big and you'll have to lug its heavy frame across muddy fields to your pitch. If the tent is cheap and poorly made, come nighttime you'll be feeling cold, wet and cranky. Take something too expensive and you risk it getting wrecked during an impromptu campsite shindig. So, what's the solution? A budget 2-3 man backpacking tent. We recommend the Vango Banshee, a superbly versatile and fast-pitch tent that can be used well beyond festival season. The other option is a family-friendly tent like the Outwell Montana. This is a great space to sleep in if a few of you are camping together, and has a living room that doubles as a chill-out space when you need a break from the festival madness. Once you’ve picked up your ideal tent, it's time to customise it. Why? Well, whether you're trying to find your way back in the early hours of the morning, or just trying to spot your khaki tent in a sea of thousands, adding a defining accessory or two will help you avoid any embarrassing 'Oh, sorry, I thought this was my tent!' gaffes. Glowing guy ropes, self-illuminating tent pegs, reams of bunting, or a flag to fly jauntily from the top of your tent are brilliant for this. Some other canny campers may have the same idea, so choose unique accessories that few others will have. Listen, you may enjoy being tucked up in your sleeping bag by midnight, cup of cocoa in hand, but your camping neighbours may only be getting started by then. Prepare yourself for hours of revelry. And Def Leppard on repeat. So yeah, there's a strong chance you won't get much sleep when festival camping unless you come prepared. If your tent doesn't have blackout fabric, sleep masks are essential for blocking out early morning sunshine. Another essential purchase is a set of quality earplugs, such as Flare Audio's Isolate Mini Earplugs. They'll protect your ears when you're watching bands and they'll drown out noisy campers who think everyone's idea of fun is singing along to The Wurzels at 4am. Most tents have a double zip that can be locked with a small padlock to thwart opportunistic thieves, but you'll be cursing yourself when you get back to your tent in the early hours only to discover you can't find the key. Theft-proof rucksacks from the likes of RiutBag are the ideal solution. The zips sit flush against your back when you're wearing the pack, so whilst the bag is easy for you to access, nobody else can get inside. We love the RuitBag Crush, which can be flattened down when not in use. If you don't want something as big as a rucksack, and are only bringing smaller valuables, don a bum bag. You may not like the look, but there's no denying they're an easy way to keep tabs on the small stuff. Speaking of phones, there's small chance of your phone's battery lasting the whole weekend on its own, and while lots of festivals have charging points, these often attract major queues. Who has time for that when there are bands to watch? Instead, pack a portable battery to charge your various devices overnight. The Mophie Powerstation Plus XL will keep your phone, and other small gadgets, charged for days, and can charge two devices simultaneously. If you're worried about losing your expensive smartphone at the festival, consider buying a 'dumb' phone. These let you text and make and take calls, but don't do much else. The rejuvenated Nokia 3310, for example, has nearly a month of standby battery and is cheap enough that you won't cry if you drop it in the mud. If there's one thing you'll find plenty of at festivals, it’s rain and mud. Lots of mud. Wellies might take care of the latter whilst you're outside, but when you get back to your tent there’s plenty of opportunity to stomp mud over everything inside too. This is where a good supply of bin bags comes in handy, and standard kitchen ziplock bags also make sure that wet things stay separate from dry things. A more pro and eco-friendly way to keep wet clothes away from dry clothing is a drybag, such as those made by Aquapac. Drybags are ace for storing clothes in your tent, and will come in handy for other outdoors escapades, like surfing. Not all festivals allow cooking in the camping areas, but if they do and you fancy doing some outdoors cooking, opt for food that's quick and easy to make and eat. An all-in-one cooker like the Primus Lite is ideal for knocking up simple meals such as soup, noodles and pasta. You can also use the portable stove to boil water for a cuppa or an espresso if you've hit the festival bar too hard and need some rocket fuel. Portable barbecues are also a popular choice for festival camping, but check the campsite's regulations to make sure you're allowed to BBQ next to your tent. This may seem like a no-brainer, but we'd be remiss if we didn't wax on, even for a short while, about the importance of outfitting your festival camping setup with clean water storage. Having a larger container for your tent means you don't have to keep refilling your portable water bottle every hour. Choose a collapsible water carrier, such as the Konky Folding Water Bucket, available in different sizes from 5 to 15 litres, to store larger quantities of clean water in your tent. Then grab a Hydroflask insulated water bottle for your backpack, so that you can sip cold water on the go. If you’ve opted for a family tent with a dedicated chill-out space, you'll need some tunes to kickback with. But even if your tent is dinky, being able to play your own music while you're chilling out or getting dressed for another session will amp your enjoyment of festival camping. A portable, rugged and water-resistant Bluetooth speaker is the ideal solution here. You may also want a speaker that's small enough to carry around with you and not leave in your tent. The Ultimate Ears Wonderboom is the perfect choice, being small, waterproof and serving up a generous 10-hour battery life and decent sound. From creating ambience to beaming direct light when you're trying to find your phone, in-tent lighting is an essential for festival camping. A head torch is handy for night-time wandering. The Petzl Reactik+ is a great all-rounder head torch that will serve you well, or for sheer wallet-busting brilliance try the Alpkit Viper. The downside of using your headtorch as a lantern is that it takes a hit on battery life, so pack a separate camping lantern. If you aren't taking a portable battery pack, opt for the Black Diamond Moji charging station and use it charge your phone.